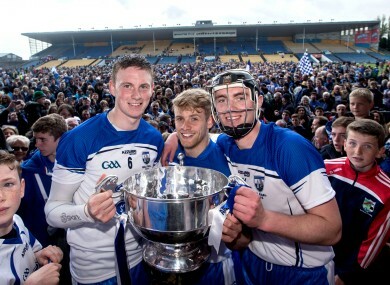 Waterford trio Austin Gleeson, Martin O'Neill and Pauric Mahony celebrate their victory. WATERFORD’S REMARKABLE HURLING revival continues after they were crowned Division 1 league champions in Semple Stadium this afternoon with an emphatic dismissal of Cork. Relegated from Division 1A twelve months ago, Waterford’s turnaround has been hugely impressive with promotion clinched from Division 1B and now a league title collected by Derek McGrath’s young side. Pauric Mahony once again spearheaded their scoring drive as he chipped in with 0-11 while Austin Gleeson, Kevin Moran, Michael Walsh and Maurice Shanahan all made vital scoring contributions. Waterford inflicted a third league final defeat in six years on Cork after a hugely disappointing performance by Jimmy Barry-Murphy’s side. Cork couldn’t break down Waterford’s defensive structure with Patrick Horgan, accurate from frees throughout, well marshalled by Noel Connors. Conor Lehane was excellent as he fired 0-5 from play but Cork ultimately didn’t pack a sufficient scoring punch. They came close to hitting the net twice but Stephen O’Keeffe produced a sublime first-half save to deny Seamus Harnedy while Lehane rattled the crossbar in the second-half. Waterford made the early running to forge a 0-7 to 0-5 advantage by the 18th minute. Cork pulled a couple of points back yet Waterford’s confidence soared when Austin Gleeson launched over a stunning 29th minute point that sent them 0-9 to 0-5 clear. They were 0-11 to 0-7 ahead at the interval and full value for that position. Cork’s form improved early in the second-half. Aidan Walsh’s 40th minute point left them 0-13 to 0-10 adrift but then they were the victim of some contentious officiating decisions. The umpires adjudged a Bill Cooper shot, that looked to be between the posts, as wide and referee Johnny Ryan awarded two frees that sparked fury amongst the Cork supporters. The ultra-reliable Mahony nailed both of those for Waterford and they went 0-16 to 0-10 clear with twenty minutes left. The huge Deise following sensed a major success and their team capitalised on the opportunity. They were in front 0-20 to 0-14 with eight minutes remaining when substitute Devine bundled a shot home and they closed out the game in style from there. Scorers for Waterford: Pauric Mahony 0-11 (0-8f, 0-1 ’65), Tom Devine 1-1, Kevin Moran 0-3, Austin Gleeson (0-1 sideline), Maurice Shanahan, Michael Walsh 0-2 each, Jamie Barron, Brian O’Halloran, Stephen Bennett 0-1 each. Scorers for Cork: Patrick Horgan 0-7 (0-7f), Conor Lehane 0-5, Seamus Harnedy 0-2, Aidan Walsh, Bill Cooper, Rob O’Shea 0-1 each. Email “Waterford crowned hurling league champions with emphatic win over Cork”. Feedback on “Waterford crowned hurling league champions with emphatic win over Cork”.